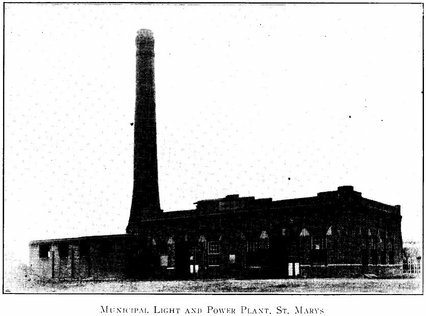 Responding to a petition, the St. Marys City Council called for a special election on August 11, 1908, to vote on $15,000 in bonds to construct an electric light system. The bond issue passed 339 to 16, and by July of 1909 the steam powered plant was online with two generators (75 kilowatt and 50 kilowatt). To facilitate electrical use the city hired an electrician to wire resident’s homes, if they would provide the materials. Early on about one hundred of the city’s three hundred homes were using electricity and it was believed that if the other two hundred homes would get on board the electrical plant would be cash flowing by June of 1910. Although profitable at times, using steam power to produce electricity proved to be much more expensive than some of the more modern equipment that was being used by a local transmission company. Consistent losses from 1912 until 1921 led the city to begin purchasing its electricity from the Manhattan, KS, based Rocky Ford Milling & Power Company (United Power & Light) on December 1, 1923. The city’s plant was still run every week to keep it in operational condition for use during emergencies. In 1928 the coal fired engine was replaced with a fuel oil engine. During the summer of 1956 the smoke stack was damaged by lightning, and after nearly 40 years of non-use, it was demolished in 1957. In April of 1986 a bid was accepted for tearing out the walls, footings, and floor of the power house for $425. A small section of the power house remains, and in 1986 a garage was attached (now used to store fire equipment). In 1935, United Power & Light merged with Kansas Power & Light, and then eight years later acquired Kansas Gas & Electric, all of which many years later became known as Western Resources (which changed to Westar Energy in 2002). Over the years the city had renewed numerous contract extensions with KP&L. However, on September 1, 1987, the city entered into a 10-year contract that was amended in 1992 to expire on October 31, 2007. Unable to negotiate an acceptable contract, the city began buying its power through the Kansas Power Pool (KPP). 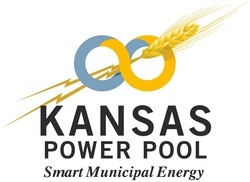 The KPP became the first municipal power pool in Kansas by delivering power to four of the founding cities of the organization. On October 31, 2007, the city’s 30-year contract to purchase electricity expired. After a lot of research, the city decided to join the KPP. In 1909, when the water and light facility was being constructed there was also interest in installing a sewage system. Many believed that a sewage system was a necessity and that within a few years the state and county health officials were going to force the issue. 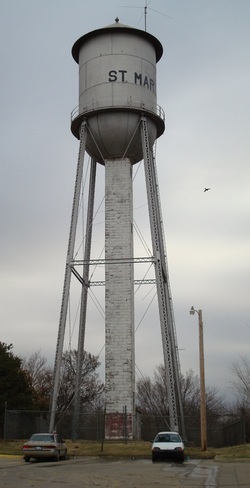 Kenny Doyle, Wamego City Clerk, indicated that when Wamego built its water works it consistently ran a deficit until a sewage system was installed and residents could use water for domestic purposes. Moreover, there was an opportunity to save $1,000 since the company constructing the water works was already in the city, they would not have to charge their $1,000 mobilization fee. Although an election was not required for a sewage system, the city council did not want to act without knowing the sentiment of the landowners. The city clerk was directed to poll the landowners and the results indicated that there was a strong sentiment for a sewage system. However, when the construction company announced that the last mile of the water trench was going to have to be hand dug and that they were moving their equipment to Oklahoma, the urgency for the sewage system dissipated. Sixteen years later, in 1924, there was once again talk of the necessity of a sewage system. However, it was the position of the city commission to wait until the water and light debt was paid off before tackling the sewage issue. Petitions circulated in 1925 led to the construction of a $43,500 sewage system (Imoff) that went online in June 1926 (the plant was at the present site of the transfer station). 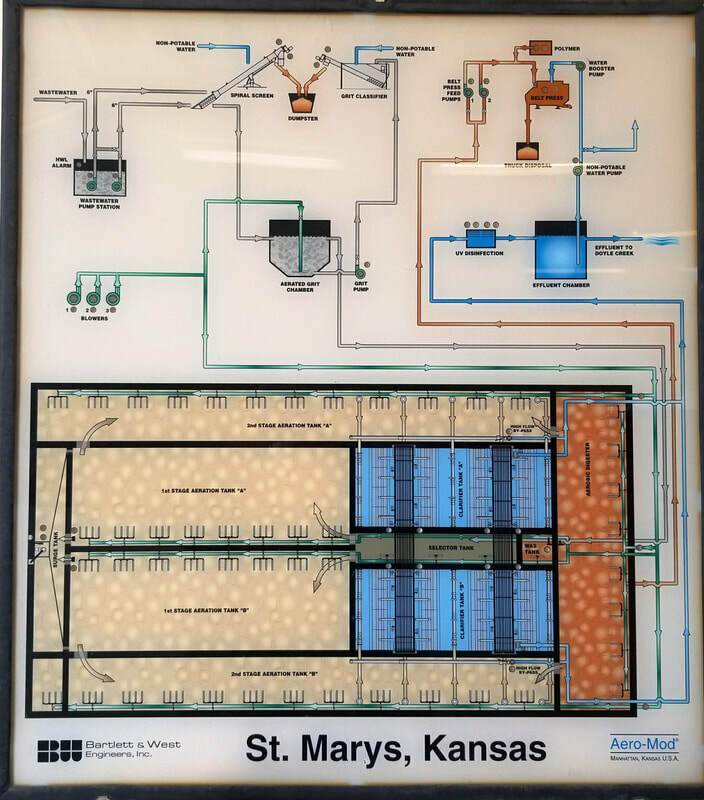 In 1963, a Smith and Loveless mechanical plant with a 0.5MGD capacity was constructed, and in 2002 that plant was replaced with the current sewer plant (0.5MGD extended aeration type wastewater treatment plant). Today the sewage system consists of five lift stations, over 12 miles of sewer main, 237 man holes, and processes on an average 160,000 gallons of flow per day. The city’s sewage system consists of over 12 miles of networked pipes, known as sewer mains, which are buried anywhere from 2 to 23 feet underground and range in diameter from 6” to 18”, with 8” being the most common size. Residents connect their homes to the sewer mains via 4-inch diameter pipes known as laterals. Once the sewage enters the system, gravity helps it reach one of the two 14” collector lines that are located along Third and Sixth Streets. The elevation in four areas of town is too low or flat and pumping stations, known as lift stations, are required to help push the sewage through the system. The lift stations are problematic, because foreign objects are sometimes flushed into the system and may damage the pumps. Every sewage system, including St. Marys, has its stories about unusual objects that have been found in the sewer mains. Over the years, Utility Superintendent Don Colson said that he has removed his share of t-shirts, diapers, toys, tennis balls, rocks, 20 oz. plastic bottles, and even a pair of sweat pants. Colson pointed out that some of the larger objects probably entered the system through clean-outs, which are capped pipes that provide access to clean out blockages in the laterals, or through one of the 237 maintenance openings known as man holes.